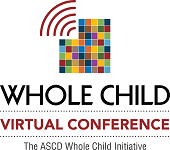 ASCD conducted its second Whole Child Virtual Conference in May. This free conference showcases schools, authors, and research about implementing a whole child approach for a worldwide audience. View and share archived session recordings, presenter handouts, and related resources at www.ascd.org/wcvirtualconference. Find additional presentations highlighting successful schools and creating a caring and positive school climate.